The early part of the week has required concentration on Governance – with Trustees’ meeting on Tuesday evening, and a meeting early on Wednesday with the facilitator of our forthcoming strategy awayday. The Trustees approved the Business Plan for 2012/13 and we can think about the longer term – 3 year strategy. I am meeting with a colleague from West Sussex CVYS to discuss possible synergies between Surrey and Sussex . I had a meeting with our uniformed organisations last night and they are geared up well to take advantage of the London 2012 Olympic Games, and especially volunteering to help with the torch relay and the road cycle race. I’ve met with two organisations that have won Surrey CC youth work contracts as the result of the commissioning /tendering process. Raven Housing will be running 5 youth centres in Reigate and Banstead, and as social housing landlords are very well tapped into these areas and are already doing good work with young people. Working Links have won the youth engagement contract and have 4 sub- contractor colleague companies. I am very impressed indeed with the creativity and professionalism of this outfit…the bar has been raised for youth work in this county. I note with interest that the Government’s Public Services (Socail Value) Act is passed embedding social value into public sector thinking, though the outworking of this in the tendering/contracting stage will reamin controversial in terms of how it adds to/subtracts from Localism and the Big Society. The setting up of our social enterprise is moving on apace, and so too our proposed “Surrey Youth Enterprises” website and support service for young people about self – employment and social enterprise. One of our trustees is entrepreneur in residence at Surrey University and is being enormously helpful with both projects. So..an enterprising week! Hi everyone – back from Easter break this week. Our figures show 3,000 blog visits last year (2011/12). I know that’s not quite Stephen Fry, or Barack Obama but hey – who knows?!! I have to hit a new target for this year – so pass the BLOG news on to others please! The theme of the week has definitely been about commissioning and contracting. I am in London this afternoon speaking at a Children England leadership course for local authority managers about the VCFS perspective on commissioning. Last night I was away from Surrey at a focus group discussion led by Capita with about 10 voluntary sector directors/CEOs about commissioning. My colleagues were an impressive bunch with many running social enterprises. The core issues were: difficulty in measuring outcomes in social policy, and the difficulty of matching a commissioning/contracting policy with the Localism/ Big Society agenda. Open competitive tendering takes you to large scale, whilst localism is about valuing local community organisations. However on Wednesday, I also met with one of Surrey County Council’s new sub- contractors for the youth engagement work – Rolling Sound - based in London, and with very impressive, innovative approaches to engaging with NEET young people, so one can see benefits to commissioning in terms of raising the performance bar. The social enterprise we have been working on for a while to provide jobs to unemployed young people is now happening, and I have to find offices, write job descriptions and move things on. I met with Guildford College this week about how we might work together to secure training for these young people, possibly through apprenticeships. We have also discussed their involvement with our forthcoming “Surrey Youth Enterprises” work – being a website giving information, advice to young people on self–employment and social enterprise and running “how to” workshops off it on a chargeable basis, and so it could also become a social enterprise. All these developments are in our new Business Plan fro 2012/13 which will be discussed at next week’s Trustees meeting and on Monday we were visited by a new independent (as opposed to Member) Trustee – Martin Gerrard DL who has a strong strategic and operational background as a Commissioner in the Met Police, and outstanding work with the Scouts in Epsom. He will bring considerable skills to the Board. So – a good week, especially as my university tutor liked my rough draft of my MA Theology dissertation (on pastoral care since you ask) ..will finish at the end of May. Up in London with all the family on Sunday to support middle son running in the London Marathon. Well the petrol strike that never was (as yet), and the hosepipe ban that causes it to rain – how contrary life is! The PM launched Big Society Bank and I watched Sir Ronald Cohen (Chairman) on the tv talking about it. I sat next to him by chance at the Social Finance conference in London about a year ago. I am quietly pleased that I having been banging on about social finance and social enterprise for the last 2 years. Sir Ronald was the inventor of venture capitalism and is a world stage figure; he will give social finance a maojor profile. I repeat Surrey ought to be the national leader on this given its financial expertise and wealth. 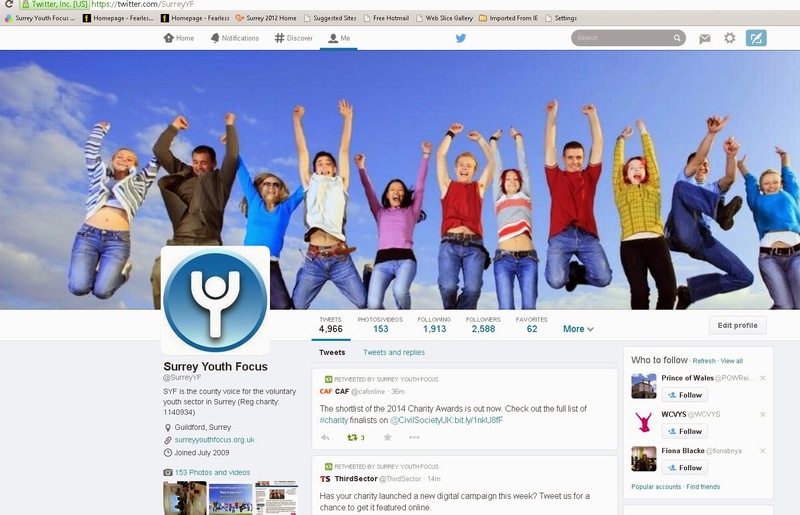 We in SYF are doing our bit in framing our bid for Surrey Youth Enterprise, about which more later. Other Government policy statements are important: Positive for Youth, the s507 obligation on local authorities to secure positive activities for young people, and most recently the Youth Contract. Just agreed with Surrey Chambers that the next round of our "4x4 project" will be on 14 June…I already have 6 member organisations lined up to participate. I am impressed with The Challenge Network who came to see me last Friday; with Catch 22 they are the contractors for the National Citizenship Scheme in Surrey and already have 570 young people signed up for this summer’s programme. Impressive. I hope The Challenge Network will become members of ours. I am meeting with Garath Symonds of Surrey CC (Assistant Director Young People) later this (Thursday) morning and we have a long list of issues and topics to discuss. I see this as part of our Representation and Advocacy role….accessing Surrey CC’s senior manager commissioning services for young people. And I know that some of the issues will need to morph into a “honest broker” role, bridge-building between parties. We also provide support services to our members. Whether we have the right balance of time between these three roles and other related matters is what we’ll be discussing at our awayday in May, with a facilitator who is just about to join me now to plan the event. She has already provided us with some training on social media, and will be great at this. I am on leave for most of next week (writing MA dissertation) so no blog now until Friday 20 April- so Happy Easter!